This was a fun project. Double knitting makes a very interesting texture at the bottom of the cardigan, and the cast-on method was neat. I also like the front edging treatment that takes advantage of stockinette’s inherent curl. The pattern has a few issues, though. There were a few times when it would direct you to work on a wrong-side row when you were actually on a right-side row, or vice versa. The diagram implies that the double-knit portion should be the same size as the bottom of the stockinette portion, but mine flares out–I’m not sure if this is my error or the pattern’s. For the left front, doing row 43 as written makes some purl bumps visible on the front of the garment, so I did that row the way the directions were written for right front instead. Cute! 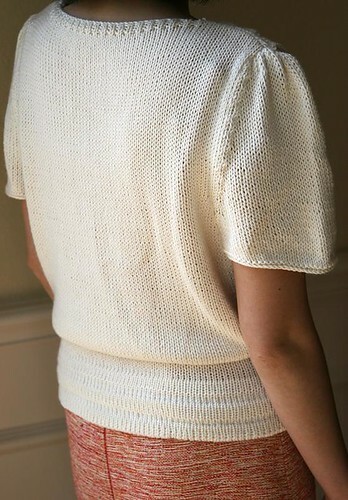 I love short-sleeved cardigans--so nice for summer. Beautiful job!